Taking my cue from the worthy and well thumbed play-book of the Brothers Coen, I thought every now and again I might follow up all those, long, desperately serious, and highly indigestible posts about how Italy should now be considered to be "No Country For Old Men", with something in rather lighter vein. The highly acclaimed and award winning Miss Iceland Look-alike show is not the only prime time TV talent contest we are going to see over the coming weeks and months it seems. We are also apparently on the verge of watching a beefed up and much more macho version, whose pilot screenings have now been launched under the working "Man-City/Emirates Stadium" look-alike title, since news today informs us that the Libyan government is at this very moment in the process of bailing out Italy's much troubled banking system (following in the well trodden footsteps of AC Milan, who were, it seems, able to partially finance the acquisition of the the world's former number one footballer - Ronaldinho Gaucho - thanks to a fundraising trip to the Arab Emirates). The investment may be worth much as 1.3 billion euros, according to a note by Centrosim analyst Marco Sallustio published this morning. It could allow Libya to obtain a seat on the bank's board. Central Bank of Libya, Libyan Investment Authority and Libyan Foreign Bank bought shares to boost their holding to 4.2 percent, the investors said in a statement late yesterday. They intend to buy as much as 500 million euros of securities that UniCredit plans to sell over coming months. But then, where do you imagine that the greatest risk to the viability of Italy's Unicredit lies? And what do think is the the principal reason why both Italy and its banking system need this sudden Libyan support? Well you might try looking "over there", you know, where they are holding the Miss Iceland look-alike contest. - - UniCredit is one of Europe's top 10 banks by market value, with a capitalisation of about $39 billion. It is second to Intesa Sanpaolo SpA among Italian banks. -- In a U-turn on Oct. 5 it announced plans to boost capital by 6.6 billion euros. It will ask investors for 3 billion euros in a capital increase and offer shares rather than a cash payout on 2008 results, putting 3.6 billion euros instead in its own coffers. -- UniCredit on the same day boosted its target for Core Tier I to 6.7 percent at the end of 2008 based on Basel II requirements from its previous aim of 6.2 percent. The figure was 5.7 percent at the end of June. -- It also slashed earnings per share forecasts for this year to 39 euro cents from around 52 euro cents previously. -- It is the Italian bank with the most foreign exposure. UniCredit gets about half its revenue from outside Italy and its conservative lending market. -- UniCredit, whose units include Germany's HVB, is among market leaders in Germany and Austria. -- UniCredit's share price has dropped about 62 percent since the start of the year, pushing it second to Intesa Sanpaolo among Italian banks. The DJ Stoxx European banks index has lost about 52 percent. -- First-half net profit was 2.9 billion euros on operating income of 14 billion euros. Deposits from customers and debt securities totalled 639.8 billion euros. -- The bank traces its origins back to 15th century Bologna. The current UniCredit resulted from the merger of nine of Italy's biggest banks in 1998, as well as the purchase of HVB in 2005 and Italy's Capitalia last year. -- The biggest shareholder is the Fondazione Cassa di Risparmio di Verona Vicenza Belluno e Ancona, at 5 percent. Fondi Barclays Global Investors UK Holdings Ltd with 2.01 percent. -- UniCredit is the biggest shareholder in powerful investment bank Mediobanca SpA with an 8.7 percent stake. Italian Prime Minister Silvio Berlusconi pledged $5 billion over 25 years to Libyan leader Muammar Qaddafi in compensation for the occupation of the country in the 30 years before World War II. Italy will pay $200 million per year to Libya in the form of investments in infrastructure. The money will finance the construction of a coastline highway that runs about 1,600 kilometers (994 miles) between the Egyptian and Tunisian borders. And why, we might ask ourselves, does the Italian government find itself in need of such recourse to what we might now term "the Libyan Connection" in order to recapitalise its banks. Well, Global Insight in a very informative recent survey of the recently adopted EU government commitments to the banking sector perhaps offer us one part of the explanation: quite simply, after years of letting the public finances drift, Italy simply doesn't have any borrowing capacity left with which to raise the necessary money itself, since with debt at around 104% of GDP, people - apart from those ever so kind Libyans that is - have become increasingly reluctant to lend it to them. In a deviation from the measures seen in France and Germany, Italy has not created a fund for its rescue plan, with Finance Minister Giulio Tremonti stating that, "As of today, we estimate that it's not necessary to have a predetermined figure. "......Italy is in stark contrast to other European nations by providing no firm capital commitments; however, the government's reluctance to create a rescue fund could partly be a reflection of the restraints imposed by its substantial public debt, which stood at 104% of GDP in 2007. So, as I said, with people becoming increasingly apprehensive about buying Italian government paper, then having rich and obliging friends like the Libyan government is going to be a real boon. Oh yes, but of course when I said "people" in the last sentence, I wasn't, of course, including, at least for the moment, that other untiring friend and trusted workhorse the Italian government can still count on for support over at the ECB in Frankfurt. The Bank of Italy will also engage in a 40-billion-euro debt swap, taking on inferior bank debt for government bonds that can then be used to obtain financing from the ECB. So don't let yourself get behind the curve, and don't miss out on the very latest talent-stalking trend towards ever more exotic varieties of global look-alike contests. Now which country was it where the banks were being busily underwritten by the Shanghai Pudong Development Bank, just let me go and check my records......? Hungary's agony continues with both currency and stock markets falling sharply yesterday while bankers continue to report acute credit shortages. At the same time contagion has started to extend its ugly reach right across eastern Europe, with Ukraine, the Baltics and Serbia (at a minimum) all in ongoing negotiations with the IMF, with the credit crunch which has followed in the wake of the global financial turmoil really starting to bite. Emerging-market banks plunged this morning after Standard & Poor's warned that Korea's lenders will struggle to refinance debt, raising pressure on developing nations to bail out their own institutions. Standard & Poor's has announced that it placed its 'BBB+/A-2' sovereign credit rating on Hungary on CreditWatch with negative implications. S&P has also placed the following ratings on Ukraine on CreditWatch with negative implications: its 'B+/B' foreign currency and 'BB-/B' local currency sovereign credit ratings on its global scale; and its 'uaAA' ratings on its national scale. Hungary has a 'BBB+' rating at Fitch and 'A2' at Moody's. In Budapest yesterday the forint fell 5.3 per cent to Ft266.09 to the euro and the BUX index of leading stocks closed with a fall of 11.9 per cent, dragged down by a 15 per cent per cent fall of shares in OTP, Hungary's biggest bank. Currencies and stock markets also fell in Poland, the Czech Republic, Romania and Ukraine. The European Central Bank announced this morning that it will support the Hungarian central bank's money market operations with as much as 5 billion euros ($6.7 billion) to help it ease the present financial tensions. The agreement will provide the central bank with a facility to borrow up to 5 billion euros in order to provide additional support to the central bank's operations, the ECB said in a statement this morning. The move will support the Hungarian central bank's "instruments of euro liquidity provision.'' This move is an important "first", since Hungary isn't a member of the 15-nation euro region, a may well set a precedent which will need to be followed as more and more of the walking wounded limp over and present themselves at the Kaiserstrasse front door, before being politely shown round the back to the overnight lending window. Chaos rules among institutional investors, as well, at least the majority of the investment fund managers polled by Portfolio.hu on Wednesday admitted, speaking on condition of anonymity, that they have absolutely no idea about the possible outcome of the current financial crisis. A number of them noted they are at a loss as to what to do with their portfolios in the current situation. Interestingly enough, the only parallel the respondents were able to draw between the present predicaments and the 1998 Russian economic crisis was the mass unwinding of leveraged positions. As one fund manager interviewed said “From this perspective, the current situation is the same as in 1998 only to the second power. Margin calls are being received, you gotta put in the deposits but as there's no money you have to execute brutal sales irrespective of the price of assets.....Frankly, I haven't got a clue as to when and how this would end, I'm just staring into empty space." One of the main problems Hungary is facing right now is that if foreign currency lending continues to be discontinued in Hungary on a "sudden stop" basis, then this will mean that domestic economic activity will slow sharply and capital inflows will be considerably reduced which will cause a problem since at the present time these capital inflow amount to about €3-€4bn a year, and are thus close to the covering the ongoing current account gap. 1/ Hungary has a large debt -- the gross external debt of the Hungarian state and companies amounted to 89.9 billion euros or 93.8 percent of gross domestic product (GDP) in the second quarter of 2008, while net debt was 46.3 percent of GDP. 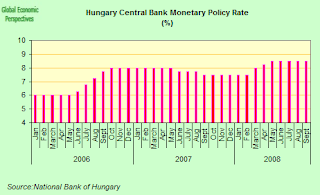 2/ Hungary had an excessively loose fiscal policy between 2001 and 2006 and this boosted the budget deficit to above 9 percent of GDP. 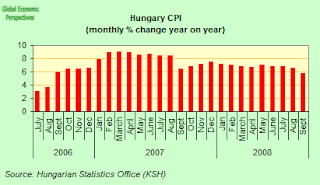 Following a mini financial crisis (and run on the forint) in the summer of 2006 the Hungarian government adopted an "adjustment programme", whereby tough measures were introduced by the government to cut the deficit, which has been falling and is now projected to reach 3.4 percent of GDP this year. 3/ As a result of the measures adopted to correct the twin deficits proble internal demand in Hungary (construction, retail sales etc) has been more or less in contraction mode since the start of 2007. 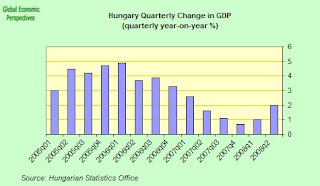 What little headline GDP growth the Hungarian economy has been able to achieve (see the sharp drop in growth after Q2 2007) has either been in agriculture (which is largely responsible for the rebound in y-o-y growth which can be noted in the first two quarters of 2008) and in exports. The export outlook is now worsening considerably, as most of Hungary's key client economies are now entering recession, and it is this deep structural weakness as much as the credit crunch itself which has meant that the Hungarian financial economy has collapsed so quickly. 4/ Hungary has been running a current account deficit, and although this has been improving, it is still expected to reach 5.3 billion euros or 4.9 percent of GDP this year according to the central bank. Next year this deficit is seen rising because slowing export growth will widen the trade gap. 5/ In similar fashion to Spain, for example, Hungary now needs to refinance its existing debt by issuing forint-denominated and foreign currency bonds, and it is this rollover which has now become much more difficult due to the global credit crunch. 6/ The Socialist government rules in a minority at the present time. There is therefore a significant element of political risk, since the government needs opposition support to pass the 2009 budget in parliament in December. This can obviously condition the kind of measures the governing party feels able to agree to, and its ability to make them stick. Oesterreichische Volksbanken AG's Hungarian unit yesterday suspended Swiss Franc and U.S. dollar loans in Hungary. The bank, which has declined to elaborate to the local press on its decision, will continue to lend euros. Bayerische Landesbank local subsidiary MKB was the first bank in Hungary this week to announce the suspension of new foreign-currency personal loans, saying the volatility of the forint made them too risky for clients. As local banks have no access to CHF they will either stop or at least limit CHF-based lending to clients in the months to come, the Hungarian business daily Világgazdaság reported on Wednesday. OTP has announced that it will not accept loan applications submitted by those who are passive debtors in the Central Credit Information System (KHR, formerly BAR) and that it too is going to greatly reduced the ratio of FX-based lending, as has the K&H Bank. All of this is pretty important, since something like 85% to 90% of new mortgage and refi lending in Hungary is denominated in Swiss Francs. Loan to deposit ratios have been rising (120%-150%) while the share of money market and foreign liabilities in funding sources has gone up considerably since mid-2007. Those who already have CHF-based loans will also be non too happy either as the interest charged on their loans is likely to rise considerably in the coming months as the HUF falls. According to the latest data available from the NBH the total value of outstanding loans to households fell in July - by HUF 36.1 billion to HUF 6,320.8 billion. 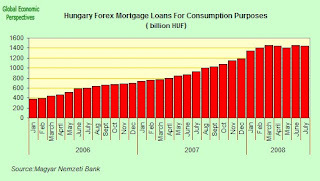 Forint denominated loans were up by HUF 2.7 billion, while foreign currency loans fell by HUF 38.8 billion and stood at HUF 3,703.7 billion. Exchange rate valuation effects need to be taken into account here, since they were calculated by the bank to have reduced the value of foreign currency loans by HUF 156.2 billion (debt to banks were reduced in HUF terms due to the strengthening of the forint) while new transactions increased it by HUF 117.5 billion. Thus as of July of the total stock of household loans 58.6% forex were 41.4% forint denominated. But this is slightly misleading, since the majority of the older loans are in HUF, while the vast majority of the post January 2007 loans have been forex ones, principally swiss franc ones. The share of housing loans in the total dropped very very slightly from 51.8% to 51.7%, while the total value of outstanding housing loans fell by HUF 23.9 billion. Foreign currency loans remained unchanged at 51.3% as a percentage of total outstanding housing loans. Again HUF revaluation effects make mortgage lending appear excessively stationary, but even allowing for the currency revaluation effect, it is clear that the rate of increase in private credit expansion has slowed considerably. If we look at the chart for forex mortgage loans for consumption purposes, the level of these has been virtually stationary since January, after a twelve month period when they virtually doubled. If we look at forex mortgage lending generally we see a similar picture, even if the rate of increase in 2007 was nothing like as rapid as in the case of consumption directed loans. Again, if we look at total mortgage lending, it is obvious that there is more than forint valuation effects at work here. It seems to me that we were already able to see clear signs of the impact of the credit crunch back in July, whether this be due to tighter liquidity conditions on the banking side, or due to the pressure of interest rates on the consumer demand side. In any event, this steady slowdown is now more than likely about to turn itself into a "complete stop". Holiday home new construction has shifted in the opposite direction from building permits. Building permits were up by 26% , while newly built holiday houses were down by 30% over the same period last year. In the first half of 2008, 650 holiday units got building permits and only 200 units were built, with the average size of 66sqm. That is, there are more obtaining permission to build, but less of them - for some "strange" reason - are building. But while our attention is currently focused on the crisis in the financial system we should never lose sight of the underlying problems in the real economy, and how they are likely to be adversly affected by what is happening now. Hungary's industrial output dropped for a third consecutive month in August as slowing growth in western Europe curbed demand for its exports, which are now the only real drive of Hungarian GDP growth. Production fell an annual 1.2 percent after declining 1.8 percent in July, and 0.3% in May according to data from the national statistics office. Output did however rise 0.8 percent over July. Industrial output fell for the first time in three and a half years in June as the looming recession in the eurozone stifled demand for products assembled in Hungary such as Audi cars and Nokia phones. This slowdown already threatened to bring Hungarian GDP growth close to recession in Q3, and the recent financial turmoil now makes it almost certain that any (possible) Q3 contraction will be followed by a further one in Q4 with worse to come as we enter 2009. The volume of industrial exports plunged by 7.2% yr/yr vs. an increase of 0.3% in July. If we look as the seasonally adjusted industrial output index, we will see that the level of output more or less peaked in December 2007 - February 2008, with the high point being in February, and with the level of output steadily slowing since. 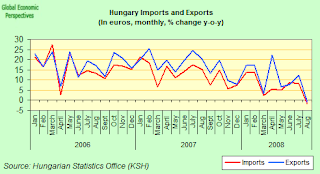 If we look at the most recent purchasing managers index (PMI) reading we find that the rate of expansion in Hungary's manufacturing sector expansion slowed again in September (after August's mini boost) and remained close to stagnation as new orders growth dropped sharply while the rise in output also eased, according to the monthly report from the Hungarian association of logistics, purchasing and inventory management (MLBKT). The September PMI fell to a seasonally adjusted 50.3 from 51.9 in August. The figure is the lowest for any September in the past three years. In Sept 2007 the index stood at 55.1 (a reading of 50 marks the frontier between expansion and contraction, and 50.3 is this a very, very fractional expansion, if it be confirmed by the final data from the KSH). One clear indication of problems to come can be found in the fact that European car sales fell 8.2 percent in September, extending a decline that began in May, as higher fuel prices and financial-market turmoil reduced demand. Registrations in September dropped to 1.3 million vehicles from 1.42 million a year earlier, the Brussels-based European Automobile Manufacturers' Association said in a statement earlier this week. Sales for the first nine months fell 4.4 percent to 11.7 million vehicles, compared with a 3.9 percent contraction through August. Industrywide sales in western Europe, including the 15 countries that were members of the EU before May 2004 plus Iceland, Norway and Switzerland, slid 9.3 percent to 1.21 million vehicles. Deliveries in the 10 eastern European countries that have joined the EU since 2004 increased 7.8 percent to 93,275. The association's figures don't include deliveries in Russia. New car sales inside Hungary are also well down, and dropped by 4.6% year on year in the January-September period, according to data published today by the Association of Hungarian Vehicle Importers (MGE) . The lions share of this drop must have come during the July to September period, since MGE only reported a 1.4% drop in the first six months of the year. Inflation Eases Back In September, But Will We Now Head For Deflation? Seasonally adjusted core inflation decelerated to an annual 5.0% from 5.8% in Aug, according to Central Statistics Office (KSH) data. In monthly terms, core CPI also remained unchanged as comparesd with the 0.3 % rise registered in August. This deceleration is pretty swift, and were in not for the sharp fall in the forint, we would now be expecting strong disinflatioary pressures to make themselves felt in the coming months. The big surprise seemed to be in the processed food components, where a much slower disinflation (following the drop in fresh food prices resulting from this years excellent harvest)had been foreseen. Bread prices were for instance down, despite the fact that local bakers had been threatening further increases. Processed foods were flat month on month taking the year on year index down to 13.2% from 16.0% a month earlier. In what could be interpreted as an early warning signal of what may be in store further down the road, however, durable and non-durable industrial goods prices continued to rise as the weaker forint fed rapidly through rather quickly to prices. 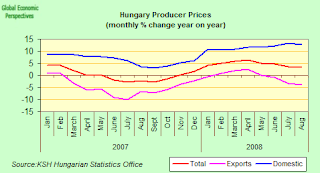 Producer prices were up in Hungary by only 3.2% year on year in August, down from July's 3.7% rise, and way down from April's 6.5% peak. The breakdown of these price increases is also interesting, since domestic sales prices were up 12.9% over August 2007, while export sales prices (measured in HUF) actually decreased by 3.9% year on year. One thing the Hungarian economy is NOT doing to any great extent these days is creating employment. The number of employees in companies employing at least 5 people and in the public sector (combined) dropped by 0.5% year on year in July to hit 2.755 million. This decline follows a 0.9% annual drop in June. 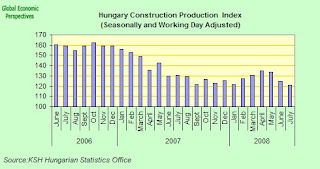 Actually this process is only natural (and more or less to be expected) as the Hungarian population declines, but of course it does mean that the only real way the Hungarian economy can grow is by increasing productivity, and that in June something like the first 1% of productivity any productivity improvement Hungary was getting was eaten up by diminished employment. Clearly the answer to this is to increase labour force participation rates, but while this sounds fine in theory (and is generally what is recommened by think tanks grom the World Bank to the OECD, see for eg the World Bank report from Red to Grey), but we are a long way from seeing it happen in practice in Hungary. The distribution of the labour force is changing, however, since the number of employees in the private sector rose by 0.3% year on year in July while employment in the public sector decreased by 3.5%. On the other hand, and to put all of this in some perspective, there are now over 100,000 fewer employees in the private sector than there were in June 2003. 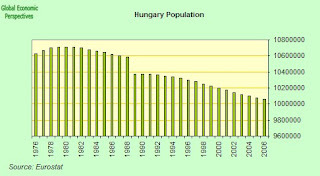 Hungary's present population is something like 10.03 million, and this is down from 10.22 million in 2000. The rate of decline is small, but the attrition is constant. But as well as falling, Hungary's population is also ageing, and we know from basic life cycle theory (Modigliani) that saving and spending patterns change across the life cycle, with the propensity to borrow against future income to buy now declining significantly after 50, and since it is increasing consumer credit that drives retail sales growth in the dyamic internal consumption economies, then it is highly likely that ageing will now act as a drag on sales growth generally in Hungary. As we can see in the chart below, Hungary's median population age has been rising steadily, but the rate of ageing is now about to accelerate quite sharply, with the only real substantial unknown between now and 2020 being life expectancy, which may accelerate more than anticipated (in which case the population ageing will be even more rapid). Apart from retail sales, another indicator of domestic demand which is worth thinking about is housing construction. Let's look at the chart. As we can see the number of new buildings peaked in 2004. Since that point the sector has struggled. Obviously the absence of new households can be offset to some extent by holiday homes, but this has limits, and in the present credit crunch environment is unlikely to be as important as many anticipated. Despite the general economic slowdown there was a rebound in housing activity in 2007, but in the wake of the US financial turmoil of August 2007 this now seems to have faded. It will be many a long year (if ever) before we see construction on the 2004 scale in Hungary again, since housing is, above all, about demographics. So what does all this mean for Hungary? Should people simply pack their bags and leave. No, not at all. What it means is that it is all about exports now, as far as the Hungarian economy goes, and the sooner Hungarian civil society (together with the civic institutions - parliament, central bank etc) faces up to this, the better. Given the rapid ageing that Hungary is now faced with, and the need to maintain a health and pension system with some kind of minimum guarantees, then economic growth is essential, and the only way to get this economic growth is through the export sector, and this is now a hard fact of life. Indeed it is precisely because the structural commitments to current expenditure are so large in the Hungarian case, that the downturn in public sector construction has been so strong following the austerity package. The sooner everyone faces up to all of this the better. And if we look at the short term outlook for Hungary's export sector, then it doesn't look too bright, since Hungary posted a trade deficit of EUR 103.7 million in August, according to first estimate figures released by the Central Statistics Office. This compares with a deficit of EUR 365.1 m in July and EUR -176.5 m in Aug 2007. Exports - at EUR 5,378.3 m - were down 0.7% year on year, which compares with a growth of 8.2% in July. The August drop is significant, since the last time the 12 month export index was in the negative territory was in June 2003 (-1.3%). Imports - at EUR 5,482 m - were down 1.9% year on year, while in July they were up by12.4%. Tightening credit standards and the cut-back in credit lines to producers and wholesalers suggest there will be a further dramatic fall in new orders, which is likely to weigh on export performance. The question is how long and how far credit standards will continue to tighten, but the chances of a prolonged deterioration in financial conditions have increased, pointing towards sustained weakness in the real economy for some time to come. Construction output is falling steadily in Hungary, and output fell more strongly in July - down by 11.8% year on year, than it did in June, when there was an 8.1% drop. Taking the number of working days into account, the decline was 12.8% in July, and 9.0% in June. Adjusted seasonally and for working days, output contracted by 2.8% month-on-month from June, following a 5.5% month on month contraction in June. July was the third consecutive month when construction industry output dropped. Output in January-July was down 10.9% over the same period of 2007. While the index will probably settle down a bit in the autumn, given the base effects due to the strong plunge in output last autumn, we are unlikely to see any short term improvement in construction output, and given the ongoing turmoil in the sector globally the position will more than likely continue to deteriorate for some time to come. Maybe someone will one day wake up to the fact that with an ever smaller and older population in the longer term you need fewer and fewer houses. 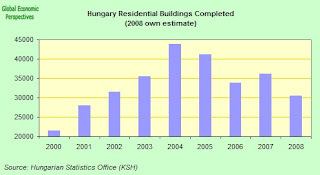 As can be seen from the chart below, the level of construction activity peaked in Hungary in 2005 (along with domestic private consumption growth), and given the population situation, and that civil engineering will be continuously constrained by government budget commitments to health and pension programmes in an ageing society, it is very unlikely that we will ever again reach that level. Remember here, we are talking about the RATE of output, and not the STOCK of buildings, bridges, motorways etc. I simply can't see why none of this can enter the mindset of those who are sitting stoically, arms folded, waiting for the "inevitable" upturn in Hungarian domestic consumption. Less retail sales, less building, less people working, this is, I think, what you should expect with a declining and ageing population. And, of course, we are about to see this phenomenon repeated in one society after another as the process spreads. Hungary is simply unfortunate enough to be among the first. 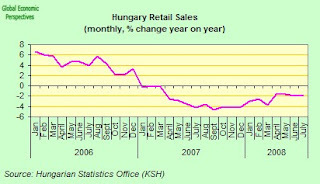 Hungarian retail sales were down by 0.1% month on month in July, following a 0.3% drop in June, according to the most recent calendar and seasonally adjusted data from the Hungarian Central Statistics Office (KSH). Using calendar-effect adjusted data, there was a fall of 1.8% year on year in July, following a 1.9% decline in June. Retail sales declined in 2007 by 2.9%, which compares with an increase of 4.4% in 2006 and 5.6% in 2005. 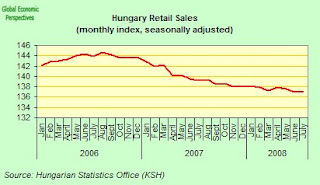 As can be seen from the monthly seasonally adjusted sales index (below), Hungarian retail sales peaked in early summer 2006, from which time they have been steadily falling. As far as I can see, with an ageing and falling population, and domestic demand stagnating, is quite possible that Hungarian retail sales will never reach this historic peak again. Despite the slight acceleration in Hungary's annual economic growth seen in the second consecutive quarter in Q2 - which was largely as a result of a surge in agricultural output - underlying trend growth in the Hungarian economy is now extremely low - I would say between 0 and 1% per annum. So the charts are deceptive at this point, since agriculture was up 33.8% year on year, meaning that it contributed about 50% of the quarter on quarter growth despite being a very small segment of the economy. Such significant movements in GDP due to volatility in one small raw materials sector is a characteristic wich is much more typical of a developing than of a developed economy, and therefore what is so striking about Hungary's current situation is just how little it has been able to move away from this role model over the last seven or eight years, despite all the financial wizardy to which it has been subjected. Gross domestic product was up by an annual 2 percent in Q2 2008, and this was the fastest rate since the first quarter of last year. 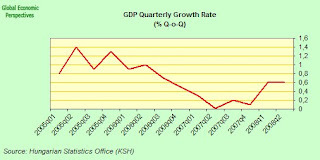 The figure compares with the 1.7 percent growth achieved in the first three months of 2008. Over the previous quarter GDP was up by 0.6%, equalling the performance in Q1 over Q4 2007. Agricultural production rose an "extraordinary'' 33.8 percent compared with Q2 2007, largely due to a bumper wheat harvest which was up 40 percent this year (to 5.6 million metric tons) following a very poor harvest in 2007 after frost and drought damaged the crop. Industrial production was up only up 4.2 percent year on year, due to the slowing pace of export increase. IP had risen by 6.9 percent in the first quarter. Private Household consumption also showed some signs of life and rose 1.4 percent. This was the biggest leap in private household consumption since Q3 2006. Indeed, quarter on quarter, household consumption was up 0.5%, which was the fastest quarterly rise since Q4 2005. Since this is really quite a surprising result it will be interesting now to see what happens as we move forward. On the other hand there is evidence that the stronger forint has been having an effect on exports. Indeed the annual growth in imports (at 11.2%) just exceeded the annual growth in exports (11.1%), hence the net impact of trade on GDP growth was marginally negative. The services and real estate sectors also slowed in Q2, with finance and real estate contracting by 0.3% quarter on quarter. Given that the rate of increase in new mortgage lending has now been slowing for some months, and new building permits are way down year on year, can we start to detect the first initial effects of the extending global credit crunch in Hungary at this point? Investments as we have seen in a previous post were down year on year by 2.2%, while construction was down year on year by 6%. Given that the external environment in the Eurozone is now deteriorating, the industrial output (as we are also seeing for July today) is losing steam on the back of the high forint, I think we are more than likely going to see a steady reduction in the annual rate of growth as we move forward again, especially since one off factors like agriculture will not be so important, and can't be guaranteed to always show up just when you want them. It is hard to put a precise number on future GDP growth at this point, given the dramatic events which are unfolding around us. We first need to see the actual GDP data for Q3 2008, but if we look at the industrial output, retail sales, construction and exports data presented above, it is hard not to come to the conclusion that the economy may well have contracted quarter on quarter in Q3 (even despite the good agricultural performance, which will, after all, enjoy a strong base effect from Q2), and if this is the case then with Q4 almost certain to see quite a strong contraction, it isn't unreasonable at this point to think that Hungary entered recession on 1 July 2008. Hungary's Magyar Nemzeti Bank left its benchmark interest rate unchanged at the three-year high of 8.5 percent at its last meeting on 29 September as the global financial crisis and upside risks to inflation forced prevented the bank from initiating a rate cut cycle. Hungary's rate is currently the second-highest in the European Union after Romania, whose current base rate is 10.25 percent. keep going on contracting the loans. So now, as the economy itself continues to head downwards, and with more fiscal tightening on the agenda and an evidently more difficult external environment for exporters to confront as the eurozone economies themselves slow it is hard to see where growth can come from, and Hungarian economy now seems to be badly in need of some sort of stimulus shot or other. The ECB loan announced to day is really more of an "additional damage avoidance life support package" than it is any kind of monetary stimulus, while the NBH clearly can't start to enter a monetary losening mindset without undermining the forint, and with it the solvency of those who are paying the CHF denominated mortages. So we really now at a stage where things will inevitably move on over to the political front, and we need to ask ourselves just one more time, exactly how much more of this type of medicine with no tangible results is the Hungarian voter actually going to put up with before we see evidence of some sort of substantial protest? And when the protest does come - with all the technicians and economic specialist having failed them - just what kind of form might we expect this political protest to take? Well, the Icelandic authorities seem to have bitten the bullet, and after some coming and going agreed to accept assistance from the IMF. An IMF mission is on the island preparing a plan which will then be put to the Icelandic government (protocols here are important). Under negotiation are the terms of any possible loan. According to Einar Karl Haraldsson (a political adviser to the Icelandic government) the plan is expected to be finalized in the next few days, after which the government will have to decide whether to accept the aid and the terms under which it is being offered. Meantime a growing number of countries now seem to be at risk of following Iceland and Hungary into the arms of the IMF, with the Baltic republics of Estonia, Latvia and Lithuania now looking particularly vulnerable, according to a warning from the International Monetary Fund itself yesterday. Dominique Strauss-Kahn, managing director of the IMF, which was formally approached yesterday for assistance by Hungary as well as Iceland, said: "The fallout for most banking systems in emerging and developing economies has been limited so far but signs of stress are growing, " Strauss-Kahn said some banks in eastern Europe have become increasingly exposed to struggling property markets, having raised funds on international money markets in the same way as the ill-fated Icelandic banks. I'm sure that the latter statement is true, even if not in the sense that Vaikulis meant. Nonetheless the Latvian government has taken the step of raising guarantees on all bank deposits to 50,000 euros ($68,225), in line with an earlier decision by European Union finance ministers. In my view the threat to the Baltic financial systems is real, as is the threat to the Bulgarian and Romanian ones. Action, of some form or another needs to be taken, and soon. Latvia and Estonia are now in deep recessions, and Lithuania, while still clinging on to growth, can't be far behind. Basically it is hard to see any revival in domestic demand in the immediate future, which means these countries now need to live from exports. But with the very high inflation they have had it is hard to see how they can restore competitiveness while retaining their currency pegs to the euro. The IMF will almost certainly insist on a currency float as a condition of rescue, and if you look at the speeches of Lorenzo Bini Smaghi and Jürgen Stark over the last year, it is clear that thinking at the ECB runs along pretty much the same lines. So better get it over and done with now I would say, and take advantage of the shelter offered in the arms of the IMF. Indeed the more I look at what is happening, the more it would appear that a division of labour was agreed to in Paris last weekend, with the EU institutional structure sorting out the mess in Ireland and the South of Europe, and the IMF taking care of all that broken crockery out there in the EU10. In what is likely to become a sign of the times Hungary's MKB Bank announced that yesterday that it is going to stop providing euro- and Swiss franc-denominated loans until further notice. In defence of its decision MKB said the huge volatility registered in the value of forint in recent weeks, and especially the strong depreciation at the end of last week, make the outlook on the currency extermely uncertain. 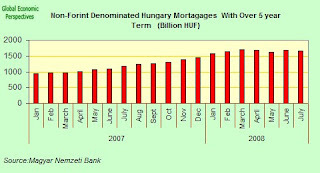 Most other Hungarian banks are expected to follow MKB's lead. This practice of bringing an end to the extremely dangerous practice of offering foreign exchange denominated loans in countries running large external deficits is now likely to come to a screeching halt all across the CEE and CIS economies, and bit by bit the IMF will have to be brought in to offer support during the transition back to reality. For a full and thorough analysis of the current threat to the Baltic economies, see this whopping post this morning from Claus Vistesen. Well, Europe's leaders have finally bitten the bullet. Faced with what IMF head Dominique Strauss Kahn warned could turn into a global financial meltdown, our leaders have risen to the challenge, at least to a certain extent. The details of what has been agreed continue to remain vague, but obviously I think it is a good FIRST move. More will now almost inevitably follow, but our reluctant leaders have finally got their feet wet, and the bathing costume is on. Now it is only left for them to dive into the ocean which lies in front. And, of course, the situation was not without its theatricals. Initially billed as a "eurozone only" meet-up, Gordon Brown was ultimately summoned, a move which was not totally essential, but since he was the only one with a real "going plan" on the table, the invitation made sense. Of course Brown himself has been relishing it all, proudly proclaining that Britain will "lead the way" out of the credit crunch, and adding in true Churchilian style that "I've seen in the cities and towns I've visited a calm, determined British spirit; that, while this is a world financial crisis that has started from America, Britain will lead the way in pulling through." While the details at present remain vague the important point would seem to be that Europe's leaders have made a commitment not to allow any systemic bank - in Western Europe (the guarantee does not extent to Hungary which today had to turn to the IMF for support) - to go bust, and it will now be hard for them to go back on this without losing all credibility. 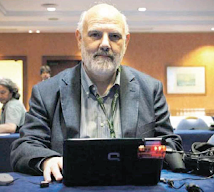 The deposit guarantees - which may be useful in terms of reassuring the general public - would now seem to be largely redundant, since if the large banks, and their debts, are to be guaranteed, then logically the deposits themselves are safe. And while Europe itself will underwrite the systemic banks, the national governments will be able to handle the smaller ones (Spain's regional cajas etc) at local level. So government finances will guarantee the banks, but who will guarantee the government finances? This, at this stage may seem to be an idle question, since none are under direct threat, but I think we need to be clear here, the money which will now need to be spent - and it is way too early to start trying to put precise numbers - will have to come from somewhere, and by and large this will mean the national governments issuing debt, but if we come to individual national governments like Greece or Italy - where debt to GDP ratios are already over 100% - it is not clear how much paper they can actually issue without seeing what is know as the "spread" on their bonds increasing significantly. So while it is certainly time to breath a sigh of relief, we we far from being able to whistle the all clear. And of course the real economy consequences of what has just happened are pretty serious, and the funds which will be spent propping up the banks will not be available for fiscal stimulas packages, so the bottom line is that we, in the OECD world, may well be in for one of the longest and deepest recessions since WWII. Now, as I say, the details we have to date of what has been agreed are far from clear. What is clear is that the EU collectively has agreed to guarantee new bank debt in the eurozone (and possibly elsewhere, but this point still awaits clarification, since as I say the guarantee evidently doesn't apply to Hungary, and that should give us some sort of idea about just how strained everything is at the moment). They are also committed to the use of taxpayers money to keep any systemic banks which get into distress afloat, and by implication they are prepared to pool resources to do this (maybe by injecting funds into the ECB as the UK has pledged to do for the Bank of England). This is also a very important precedent: since the European institutional structure is something of a patchwork quilt at this point, it is clearly make, mend and improvise time. "I had a better feeling about Sunday’s eurozone summit. It produced a detailed and co-ordinated national response to recapitalise the banking system, and to provide insurance to revive the inter-banking market. But as far as I could ascertain, this was still agreement on ground rules for national plans, and it is not clear how well this agreement would cover the numerous cross-border issues that have arisen. There is no doubt that, in the eurozone at least, we have come a long way since Friday. It is an okay policy response, but I wonder whether this is going far enough at a time when global investors are pondering whether to pull the big plug." Well look Wolfgang, my favourite phrase these days is "sufficient unto the day", we have come as far as we are able to come in one weekend. There will still be next weekend, and the one after. Clearly we have not come far enough yet, but as Paul Newman discovered in a once famous film, there are only so many hard boiled eggs you can eat in one sitting. The key measures announced at the weekend were: a pledge to guarantee until the end of 2009 bank debt issues with maturities up to five years; permission for governments to buy bank stakes; and a commitment to recapitalize what the statement called `"systemically'' critical banks in distress. The statement gave no indication of how much governments were willing to spend or the size of bank assets deemed to be at risk, and European officials refused to estimate the price tag of the measures. Some indication of the numbers involved will start to emerge today, when France, Germany, Italy and others begin to announce their national measures. Often criticized for its preoccupation with inflation, the European Central Bank abruptly reversed course last week, cutting interest rates for the first time since 2003 in a move coordinated with the U.S. Federal Reserve and four other central banks. The ECB doesn't have the legal power at the moment to follow the Federal Reserve and buy commercial paper to unblock a financing tool that drives everyday commerce for many businesses, according President Jean-Claude Trichet, who also participated in yesterday's Paris meeting. ``We are looking at our entire system of guarantees and we can imagine new measures to enlarge access to our system of guarantees,'' Trichet said. As Wolfgang Munchau points out, there is now an almost unanimous consensus among economists about the need for a recapitalisation of the banking system, and for the provision of some form of public-sector insurance for the money markets, even if there is no consensus about how exactly to do this. We should not forget, of course, that it was precisely the practice of offering guarantees - via instruments like credit default swaps - for what appeared at the outset to be investment grade lending but which later turned out to be extremely risky that has produced the current "near meltdown", and we therefore need to be extremely careful about the kind of guarantees we are offering, since what we do not want to happen is to see public finances meltdown in the future in just the way bank finances have. So what does all this add up to? Well, to do some simple rule of thumb arithmetic, just to soak up the builders debts and handle the cedulas mess, we are talking of quantities in the region of 500 to 600 billion euros, or more than half of one years Spanish GDP. Of course, not every builder is going to go bust, and not every cedula cannot be refinanced, but the weight of all this on the Spanish banking system is going to be enormous...............So it is either inject a lot of money now - more than Spain itslelf can afford alone - or have several percentage points of GDP contraction over several years and very large price deflation - ie a rather big slump - in my very humble opinion. And it is just at this point that we hit a major structural, and hitherto I think, unforeseen problem in the eurosystem (although Marty Feldstein was scratching around in the right area from the start). The question really we need an answer to is this one: if there is to be a massive cash injection into Spain's economy, who is going to do the injecting? Spain alone will surely simply crumble under the weight, and it is evident that the problem has arisen not as the result of bad decisions on the part of the Spanish government, but as a result of institutional policies administered in Brussels and monetary policy formulated over at the ECB. And yet, the Commission and the ECB are not the United States Treasury and the Federal Reserve, no amount of talk about European countries being similar to Florida and Nebraska is going to get us out of this one: and it is going to be step up to the plate and put your money where your mouth is time soon enough. Well, getting through to the put your money where your mouth is stage didn't take that long, now did it? Twelve weeks and two days to be exact. My central point at this stage would be that all of this is going to have, among other things, important implications for the real economy, since it is the degree of all that leveraging which we have been busy doing which is now going to have to be reduced, and while we are all busy "deleveraging", our real economies will notice a significant drop in demand. I wouldn't like to dwell too much on the point at this stage, but this was, of course, precisely what happened in the 1930s. Basically, one economy after another in the developed world is now going to become export dependent. If I take Spain as an example, perhaps things will be clearer. Spanish households are now in debt to the tune of around 90% of GDP. Spanish companies owe something like 120% of GDP, and the government, which is just about to start accumulating more debt, owes about 50% of GDP. Adding that up, Spain incorporated owes about 260% of GDP at the present time. But the situation is worse than that, since debts continue to mount. Back in the good old days of Q2 2007, when Spain's economy was busy growing at a rate of about 4% per annum, corporate and household debts were increasing at a rate of about 20% per annum. 4% growth for a 20% rise in indebtedness (or an increase of about 30% in debts to GDP) doesn't seem like that good value for money when you come to think about it - and in the meantime Spain Incorporated's indebtedness to the rest of the world (via the current account deficit) was growing at a rate of 10% per annum. Fast forward to Q2 2008, and household and corporate debts were rising at a mere 10% per annum (and government debt had also started to rise, at this point at a rate of around 2% of GDP per annum, or 4% of accumulated debt), but Spain's economy had reached a virtual standstill (true it was still growing at 1% rate year on year, but quarter on quarter it was virtually stationary). So not only is this a horrible "bang for the buck" ratio, it is also totally unsustainable. Indebtedness has to be reduced, not increased, and this can be done in one of two ways, either by ramping up GDP growth (which in the present environment is out of the question in the short term) or by burning down the debt by paying (or writing) it off. This harsh but unavoidable reality has two important implications. The first of these is that Spain is going to need external help, and the second is that while the level of indebtedness is being reduced, Spain will not get GDP growth from internal demand, and any headline GDP growth there is will need to come from exports. And of course Spain is just one (extreme) case. There will be a whole company of others who need to make this transition (the UK, Greece, Denmark, Ireland at least, and probably virtually all of Eastern Europe - now what was that football song I used to sing back then in the old days, over there on the Spion Kop... "when you walk through a storm..."). So the question is, while a host of new countries are suddenly struggling to export, who is going to do all the importing? No mean topic this one. The only person who seems to have even the inkling of a proposal here is World Bank head Robert Zoellick, who came right out with it on Sunday: we need a new multilateral structure. The global financial crisis underscores the need for a coordinated action to build a better system, he said on Sunday. "We need to modernize multilateralism for a new global economy....We need concerted action now to ... build a better system for the future." Never better said, and never was the fact that we live in an interconnected world placed under such a stern spotlight.